My goal this year is to attempt to re-read some key books that have influenced my life and to slow down on the number of books I read this year to try to read deeper. 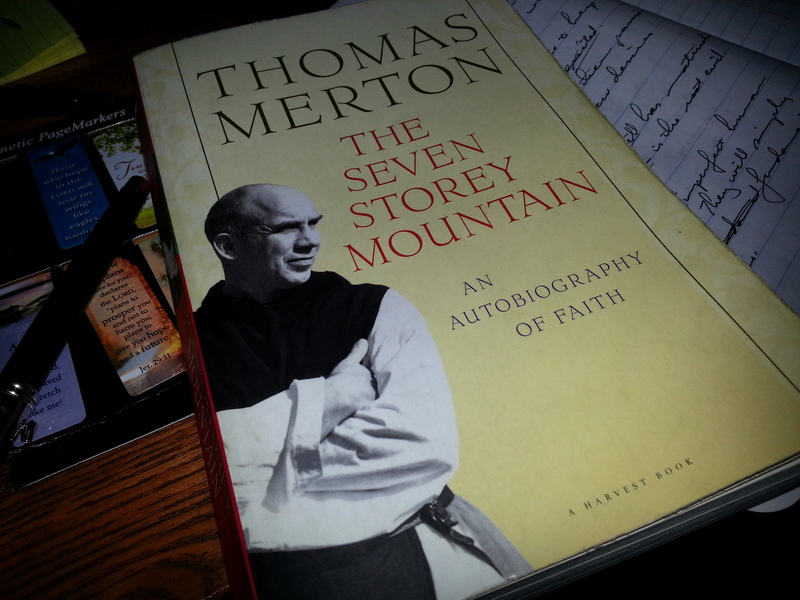 I am not sure how the “slower” is going to go, but I did finish Merton’s Seven Storey Mountain as my first book. If I do a project where I re-read things, I start with Merton because his book (besides Willard’s The Divine Conspiracy) is the only book I’ve read multiple times. Merton writes in a way where I grab something new, or am challenged again, every time I read his story. The lesson I am always challenged with in Merton’s life is prayer. We make the mistake in our Pentecostal circles (and Western evangelical circles) that motion is godly. You have to have ACTION. What Merton teaches me is PRAYER is action. Withdrawing to a monastery is not retreat from spiritual warfare. We need to understand the weight of our intercession. There is truly a great battle we undertake when we stay at the task of prayer. Several years ago I was sharing with a historian in our denomination my work on the monks of the 4th Century in Egypt and what I was learning about their “Pentecostal” experience. He dismissed it quickly, saying that he wasn’t interested in people who retreated from culture and the world instead of engaging it. We really need to give up this “either/or” thinking, but when it’s embedded culturally over hundreds of years, it’s tough. Not giving that up is what keeps this nation divided politically and culturally. Not giving that thinking up also keeps us from learning the value of “both/and” when it comes to “engagement” with this world and particularly this culture. To withdraw is not necessarily the same as to retreat from this world. Thomas Merton is the one who taught me this lesson. In Seven Storey Mountain he comes to a place where he is trying to understand vocation for his life and thinks he is not called to the monastic life. Nevertheless, he feels led to go off for a week to a monastery in Kentucky. As he enters the monastery he begins to see the life of sacrifice this particular order was called to, but it was not a retreat from the world. This was 1941. The world was exploding in war and the U.S. was racing toward involvement. It would be easy to think these monks were retreating from the cause. They were ducking their responsibility. The Lord taught Merton another lesson. To withdraw is not necessarily retreat from responsibility in this world. It may be the most responsible thing to do. The primary task is to hear the call of God and respond. What has attracted me to Seven Storey Mountain over the years is the process of coming to faith. Merton sees his life in process and even when he “comes to faith,” it’s a process. The passage of his confession and baptism into the Catholic Church is still one of the most moving passages I have ever read. He details the weight that is lifted off his shoulders, the confession of faith, the renouncing of the devil, the exorcising of demons from his life (and he knows they left), and so much more. When he knew he needed to come to faith and decided to become Catholic, it wasn’t our typical “altar call.” He sought out the priest he knew and the priest gave him three books, telling him to read the books, consider what he was doing, then come back. Lord, help us consider the cost of following you. It’s a beautiful statement that I want in my own life. My goal for reading this year is to read slllllooooowwwwweeeerr… and repeat some books. The one book I have read multiple times… okay… a second book I have read multiple times is Seven Storey Mountain, the autobiography of Thomas Merton. This is my first read of the year. This book is very easy for me to read every year or two. This is much like a modern Confessions by Augustine. And the writing is wonderful. Merton tells his story of coming into the monastic life after he comes to faith. As he weaves his story he also drops in marvelous insights into culture. It is amazing to me how someone describing something in the 1930s sounds so much like today. He has a critique of all manmade social systems. So, he IS critical of capitalism… and communism. He sees their weaknesses. It’s not that one can’t live in them… but he sees the cracks. It is really hard to believe he was observing life in the 1930s with that paragraph and not our current culture. The book is far more than observations on man-made systems. He looks back and sees the hand of God drawing him all along the journey. He recognizes key points where he is saved from really stupid choices and wonders about the power of prayer. The search for God, the restlessness of his soul, the coming to faith, then to the monastic life… it’s a wonderful read. I am working my way through Thomas Merton’s Seven Storey Mountain again. I am not good at re-reading many books, but this one I’ve ready probably 5 times. It is his story of coming to faith and entering the monastery as a Cistercian brother. As he came to faith, he struggled his first year. He was a PhD student at Columbia in 1938-39. He was learning about following Christ. The comparison he offered was Israel coming out of Egypt and moving into the promised land. God has called us to a new land and it’s a different place. We can’t act like we’re in Egypt anymore. You can no longer live here as you did there (in Egypt). Your old life and your former ways are crucified now, and you must not seek to live anymore for your own gratification, but give up your own judgment into the hands of a wise director, and sacrifice your pleasures and comforts for the love of God and give the money you no longer spend on those things, to the poor. We can’t insist on living like Egypt in the Promised Land. We have a new life given to us. The rules have changed, and they have changed for the good. No more thinking like a slave. Live free in Christ.